The predominately agricultural community of Sandy Spring lost many structures and crops to fire, having no means to control it. Neighbors would rally to each others’ aid during such emergencies, and while this demonstrated the ability of neighbors helping neighbors and pulling the community together, it also illustrated the increasing need for organized fire protection. Up to that point, because of its rural nature, the community lacked the means necessary to establish and sustain organized fire protection. After World War I, concern grew over the lack of fire protection, especially considering the large number of field and woods fires, which caused great agricultural loss and threatened homes. Two organizations, with active young men, took the early lead and expressed interest in addressing the problem. The two groups, the Young Men’s Club of the St. John’s Episcopal Church in Olney and the Brookeville post of the American Legion, adopted a plan of strategically locating pump tanks throughout the vicinity. It was these two groups who largely provided the initial membership of the fire department. A temporary organizing committee first met on November 20, 1923. They met again on November 26, and appointed 15 temporary directors. Seven additional meetings were held over the next three months, at which ideas for incorporation and procuring equipment were discussed. Ultimately, the committee sent notices to men throughout the greater community, notifying them of a public meeting for the purpose of organizing a fire department. The meeting was held at Sherwood High School on September 3, 1924, with approximately 50 men attending. The group had about $700 in funds with which to begin. Bylaws were adopted, and 15 directors were elected (in later years this was changed to 11). The first chief was A. Douglas Farquhar; Josiah W. Jones was the first president. The business meeting was set for the third Wednesday of each month; it has never changed. The membership limit was set at 50, and quickly filled. The department was the fourth incorporated in Montgomery County, being preceded by Silver Spring, Takoma Park, and Rockville. The company’s charter was completed on February 2, 1925, and included the following members: Herbert H. Adams, Ferguson Barnsley, Aubrey B. Beall, Leonard C. Burns, Dorsey Downey, A. Douglas Farquhar, William H. Gilpin, Willard Harvey, Thomas Hyde IV, Josiah W. Jones, Thomas Ladson, Richard H. Lansdale, Francis Miller, Samuel G. Thomas, and William J. Thomas. The charter noted that the area covered by the department was Sandy Spring, Olney, Ashton, Brookeville, and Ednor. The Rockville and Takoma Park departments were especially helpful to the fledgling organization. The department was housed in the Montgomery Mutual Insurance Company’s garage. The rudimentary structure was small and lacked heat; during the meetings members sat on boxes around piles of coal and fed a pot-bellied stove. The first pumper was a 1924 International chemical unit, which had two thirty-gallon tanks of soda and acid. The two chemicals were mixed in the booster tank, causing a reaction which pressurized the water. Next, a 1926 Model T Ford was purchased, which contained an Evinrude portable pump for drafting. The Bond Brothers of Ashton donated a 1927 Durant, equipped with a pump and ladder. Other early apparatus were a 1927 Reo, 1929 Chevrolet and Studebaker pumpers, and a 1931 Ford Model A chief’s car. The permanent site (at the time) of Station 4 was purchased from Mary E. Gilpin in 1927. Ground was broken on May 20, 1930. All excavation was done by the members. At the cornerstone-laying ceremony on June 19, 1930, an alarm was received. Fortunately, the call was brief and the ceremony continued. To help fund the new station, donors could purchase tiles on the interior wall of the engine room. Their names were then inscribed on the tiles. Unfortunately, these were painted over in the 1960’s. Funding of the department in those early years primarily relied on individual donations, suppers, dances, and the annual carnivals. The carnivals were held from 1926 until the early 1950’s, and were a focal point of Sandy Spring summers. The consisted of sideshows, games, and meals. Held on or adjacent to the grounds of the Sherwood High and Elementary Schools, the events were originally one day in length, expanding to nearly a week in their later years. Another fund-raising event looked forward to by the community were the pancake and sausage suppers, prepared completely by the firemen and Ladies Auxiliary. These continued until the early 1970’s. Tax support for the department was meager. A 1927 Montgomery County law provided departments with $500 per pumper, if the units had two-and-one-half-inch hose. The Maryland Forestry system also reimbursed companies for handling brush and woods fires, and also provided some equipment for that purpose, such as brush rakes, and Indian cans. Several significant fires were recorded during the first few years. In 1932, the department encountered its first mass-casualty incident when a nursing home in Colesville burned. Three patients perished in the blaze. On one hot day in May 1930, during an unusually long field fire in the Colesville area, two local women, Mary Reading Nichols and Helen Farquhar, brought drinks to the hot and thirsty men. Afterward, the women discussed the idea of forming a support group for the department. Hence, the Ladies Auxiliary was formed, which was the first of its kind in Montgomery County. Its first president was Mary Reading Nichols. Ever since, it had played a significant role in support and fund-raising for the department. Recently, the name was changed to Auxiliary and it became a membership category within the department, and it continues to be a valuable asset. Throughout the 1930’s, the department continued to expand. Membership increased, and income was steady, despite the Great Depression. Two Diamond T pumpers were placed in service, one in 1935, and another in 1939. A separate rescue squad was formed within the department. It had its own governing policies and officers. This continued until 1984, when it was assimilated into overall departmental operations. As the 1940’s approached, more fire companies were being formed in the county. Sandy Spring helped with consulting, organization, training, and loaning of equipment. Any history of the department would be remiss if special mention was not made of Spencer J. H. Brown, Sr. “Pop” Brown, as he was called, served 14 years as chief and two years as president. He also served as president of the Maryland State Firemen’s Association in 1949, and was president of the Montgomery County Volunteer Firemen’s Association in 1937, and again in 1946. He helped organize most departments in the area, including Burtonsville, Damascus, Hillandale, Laytonsville, and the 5th District in Clarksville, Howard County. These departments have named their most prestigious awards in memory of him. During his 53 years of membership, he never missed company business meeting. He left an indelible mark on the Maryland fire service when he died in 1977. Many members served in World War II, and all returned home safely. The remaining members managed to keep the “home fires” under control. Calls did increase, however, including a run to Dickerson, some 30 miles away in the northwestern end of the county for a train wreck, which resulted in many injuries and fatalities. The fleet saw the addition of another Diamond T pumper, this one a 1941 model with an Oren rescue-type body. The Ladies Auxiliary received its first canteen unit in this decade, a 1947 Chevrolet step van. In 1949, Sandy Spring purchased its first Mack pumper. An E-Model Type 85, it had a 500-gallons-per-minute (gpm) pump, and a 250-gallon booster tank. Nicknamed “Pearl”, it remained in service until 1975, when it was loaned to the Maryland Fire Museum in Lutherville. It is now in the hands of a private collector in Connecticut. A two-way radio system was installed during the 1940’s. Later, it was assumed into the county’s upper area communications office in Gaithersburg. Curiously, Sandy Spring was numbered Company 8. When the county combined its radio systems in the early 1960’s, companies were numbered in order of their incorporation, hence the Company 4 designation of today. As the department approached its fourth decade of operation, funding from sources other than donations and fund-raisers had become more paramount. In March 1954 the department, amid much controversy, voted to institute a fire tax for its jurisdiction. Some members resigned in disgust over this action. It was one of the most difficult changes: the department would never have the dependence and personal involvement with the community which it supported; it would, however, be better equipped to serve that same community. For a number of years, the department had provided rescue service. Patients were transported to the hospital in the hose bed of a pumper which was covered with a canvas top. As these calls increased, the need for an actual ambulance became apparent. In October 1953, an anonymous donor provided a used one. Because of its age, it was beset with mechanical problems. In 1954, a new Chevrolet/National unit was purchased. The fleet saw the addition of a second Mack pumper, a 1954 Model B (750/500). Still in service today as E-403, it was refurbished in 1992, and serves as a demonstration and parade piece. Today, it wins many awards and fans wherever it goes. To better handle off-road fires, a 1958 International/Oren (500/300), and a 1959 Jeep Forward Control/Oren (250/300), were placed in service. The membership also increased, with a junior member category being added. This enabled 16-18-year-olds to enter and serve in the fire service, and successfully continues to this day. Back then, applicants had to be sponsored by a present member, resulting in a waiting list. In 1955, a much-needed three-story addition was added to the east end of Station 4. This allowed for a larger engine room, and increased bunk and living space. Within the dawn of the 1960’s, the department, as well as the nation, faced a “New Frontier”. The community, long a rural one, now was becoming ever more suburban in nature. This changed the demographics of the area considerably, resulting in more members working outside of it. The need for daytime personnel coverage grew stronger. In 1962, the first career personnel were hired. Two men worked during the day Monday-Friday. The controversy surrounding this action made the earlier fire tax issue pale by comparison. Over the years, the career ranks have increased in response to demand. The area began to grow at an explosive rate, and so did the calls. Ambulance calls were the predominant service. In April 1968, Sandy Spring responded to assist with the riots in Washington, DC. Engine 41 was employed in the Benning Road, Northeast, corridor. Two substantial retirement communities were established later in the decade. The Sandy Spring Friends community and the Rossmoor/Leisure World further increased the demands for service. The extensive growth in the area emphasized the need for a second station to cover the Olney area. In 1963, the Pugh property on Georgia Avenue in the Oakdale section of Olney was purchased. In 1970, construction of Station 40 began. It was opened on December 1, 1971. The two-story station has three upper apparatus bays, and three lower bays for apparatus maintenance, in addition to the usual offices and living space. A full time mechanic was hired to maintain the increased number of apparatus. The new station resulted in the purchase of two 1971 Ford C-Series/Pirsch (750/500 ) pumpers (E-42, E-401), and a 1972 Ford/Swab modular ambulance (A-409). The 1954 and 1949 Mack pumpers (E-402, E-403), and the 1964 Jeep (B-405) rounded out the Station 40 fleet. In addition, the county placed a foam wagon at the station for several years. A 1960 Dodge/American LaFrance, it covered a large area, including one run to Westminster, in Carroll County. More career personnel were hired to help staff the new station. The 1970’s saw still more community expansion. The area was now truly a suburb of the Washington area. Membership was a direct benefit of the larger population, and with it, a larger donation and tax base. The department purchased its first diesel-powered pumper in 1974, a Pirsch 1250/500 unit, and placed it in service as Engine 401. In 1978, a similar 1977 Pirsch was added as Engine 41. A 1976 GMC/1978 Emergency One pumper, 500/300, handled brush fires and rescue calls. A 1973 Chevrolet Step Van was placed in service as Canteen 4. Two 1975 Ford/Murphy ambulances were purchased, and the 1972 Ford/Swab was placed in service as a second ambulance in Olney (Ambulance 408). A 1977 Jeep CJ-5 (85/100), became Brush 405. The department strove to obtain a medic unit. Since the paramedic program began in 1974, the Sandy Spring area was not readily covered. In 1977, the county approved two medic-ambulance, which could handle trauma and other medical emergencies but not cardiac cases, since they did not carry a monitor/defibrillator or cardiac medications. Still, the department lobbied for the unit. In an effort spearheaded by late Paramedic Jeffrey Anderson, a full Advanced Life Support Unit, Medic 49, was placed in service in June 1982. Station 4 received a lot of remodeling in 1974, increasing office and living space. The bunk area, originally on the third floor, was moved to the ground floor, improving efficiency and safety. An administrative membership category was also added, to assist with the ever-increasing business facets of the company. Also new was an Emergency Medical Services (EMS)-only category, for those unwilling or unable to become firefighters. Reflecting the increased number of women in the workforce, the department’s first female member to be involved in operations was admitted in 1976. The 1970’s saw several prominent landmarks fall victim to fire, the most substantial one being the Olney Inn, the popular restaurant which became the victim of arson on March 29, 1978. Several firefighters were injured while controlling the blaze. Specialized services were becoming more necessary in Montgomery County. three Sandy Spring members were largely responsible for establishing the Underwater Rescue Team(URT). Firefighters Charles Blocher, William Herren, and William Stroup would provide their diving services on an as-needed basis. They began to foresee the need for a countywide team, and were instrumental in forming it in 1981. The 1980’s are best remembered as the watershed years for Sandy Spring. Rapidly changing demographics resulted in fewer membership applicants. Older members were becoming more inactive. Budgetary restrictions kept major purchases on hold, stifling replacements and upgrades. All of this occurred in the face of increasing calls for service, now over 3000 responses annually. To continue to function as a volunteer organization, one with a long history and following, yet serve the community without fail, called for a major review and revision of our position. In 1987, under the aegis of Chief Louis Kaufman and President Michael Valente, the entire department and its delivery of service came under scrutiny. All functions and procedures were reviewed, from the bylaws to training standards to running assignments to solicitation drivers. As a result, sweeping changes were made in many facets of the organization. Although some members initially balked at the changes, the underlying need was for teamwork, and the membership responded in kind. Subsequent administrations (Chiefs George Brown and Thomas M. Rhodes, and Presidents Scott Robinson, Lea Gilpin, Thomas C. Rhodes, Michael Weiner, Paul Lilly, and Johnie Roth) have expounded on these revisions and new insights. One major change was to take a pro-active community stance; to openly communicate with area residents and engender their advice and support. As a result, a record in both membership and donations was set, and the department experienced a newfound strength. Montgomery County also exerted more control in this decade. The Fire and Rescue Commission was formed in 1980, centralizing governance and standards for all departments. The county also assumed apparatus and station purchases. The most sweeping change took place in 1988, when the Department of Fire and Rescue Services, initially formed in 1973, assumed full control of the career personnel. Many retirements and transfers took place as a result. Along with a strong membership and community position, the department added to its fleet two 1980 Ford/Wheeled Coach ambulances. Other ambulances which were obtained included a 1984 Chevrolet/Swab, two 1986 Ford/Collins, a 1990 and a 1991 Ford/Collins, 1994 Ford/Wheeled Coach, 1997 and 2001 Freightliner/Wheeled Coaches, and a 2005 International/Wheeled Coach. Each of these ambulances were county-owned, assigned to the department. A 1982 GMC/Hale 250/300 brush unit replaced the Jeeps. A 1983 Ford Econoline van served as the department’s first mobile command unit. This allowed the formation of the status officer position. This allowed members to respond in the unit on calls requiring a command officer, and serve as that officer’s aide. This allowed administrative and older members, as well as active ones, to maintain a level of operational activity. Two Seagrave pumpers, a 1988 and a 1990, were placed in service as Engine 401 and Engine 41, respectively. They were both equipped with a 1250-gpm pump, 750 gallon- booster tanks, and a 40-gallon foam system. Heavy rescue service had long been a part of Sandy Spring. The original Squad 4 was the 1941 Diamond T/Oren, equipped with rescue gear. After its disposal, rescue equipment was placed on the field fire unit (E-43). In 1986, E-43, the 1976 GMC/Emergency One unit, was designated Rescue Squad 4. It later was redesignated Extrication 4, since it was equipped mainly to handle vehicle extrications. The 1977 Pirsch also served in this position. In 1992, desiring a full service heavy rescue unit the department, solely with its own funds, purchased a 1992 International/PL Custom rescue squad truck. As well as the standard rescue and firefighting equipment, it has a 20kW PTO generator, a 6-bottle high-pressure air cascade system, and a 10-ton winch. It entered service as Rescue Squad 4. Fire prevention has also long been a Sandy Spring hallmark. In addition to the usual building inspections and pre-plans, the annual Open House at Station 40 has been a community favorite, teaching much in the way of fire safety. Babysitters, first aid, and CPR classes have educated many, as well. A new twist was added in 1989. Member Scott Robinson obtained a Dalmatian puppy, Max, and trained him to demonstrate fire safety techniques, such as stop, drop, and roll, and exiting the residence when a smoke detector sounds. He toured throughout the state, teaching many children fire safety, and amassing a large fan club. Two other Dalmatians, L.T. and Princess, were added later by members Kathy and Neal Abrams. Tragedy has struck the department three times, as three members gave their lives in the line of duty. On December 4, 1964, David A. Poplis succumbed to an embolism, resulting from a fracture sustained when he fell from a moving ambulance. On April 19, 1968, Captain Richard B. Thomas was with several other members responding in his personal Jeep to a brush fire on Chandlee Mill Road. The vehicle overturned, killing him. On April 1, 1971, career Sergeant Eldridge Pier suffered a fatal stroke while fighting a brush fire, also on Chandlee Mill Road. These three men epitomize the mission of the Fire Service. Two other serious incidents brushed with tragedy. On November 20, 1974, traveling west on Route 108, transporting a cardiac patient to Montgomery General Hospital, Ambulance 49 was struck head-on, killing the patient, inflicting critical and eventually career-ending injuries to career Technician Clifford Arrowood, the ambulance driver, and injuring volunteer EMT-A William Thomas IV. The ambulance was totally demolished; the other driver charged with failure to yield to an emergency vehicle. On July 18, 1982, Sergeant Michael A. Valente fell from the bucket area of Engine 41 while responding to a traffic collision in Cloverly. He sustained massive head injuries. After several years of surgeries and treatments, he returned to full duty. The early 1990’s began with a renewed strength at Sandy Spring. Under the leadership of President Thomas C. Rhodes and Chief George Brown, the department experienced a substantial growth in membership and income, setting records in each category. Station 4 was remodeled in 1994, adding additional space and efficiency. A 1992 Dodge Ram van replaced the 1983 mobile command unit. In addition to the rescue squad apparatus, the department long needed an aerial ladder unit. For nearly twenty years, it had requested funding from Montgomery County to provide such a unit, but each request was denied. Finally, in 1994, an order for a 1995 Pierce Lance ladder truck was placed. The vehicle contained a 105-foot aerial ladder, a 1500 gpm pump, and a 500-gallon booster tank. It was originally placed in service as a quint, as it was capable of serving as either a pumper, ladder truck, or both simultaneously. In the mid-2000’s, it was re-designated as Truck 40, running as a straight aerial unit. Montgomery County decided a rescue boat was needed because of the number of low-lying roadways in the response area prone to flooding during and after heavy downpours. In 1995, a 16-foot Avon inflatable boat with a 40-horsepower Johnson outboard motor was provided. Originally located at Station 40, it is now at Station 4 (Boat 4). In 1997, the department, with its own funds, purchased a new Pierce Dash 1500/750 pumper (Engine 401), and a Ford/West Potomac 230/300 brush truck (Brush 405). The department had long outgrown the long-serving Station 4. In 1995, 7 acres of land in the 17900-block of Brooke Road in Sandy Spring were bought. Beginning in 2000, construction began on a two-story, three drive-through-bay station. It provided much more spacious office, living, dormitory and meeting areas. It also included a community hall, called the Ballroom at Sandy Spring, for renting for various functions. This was to greatly aid in the department’s potential income. The department occupied the new Station 4 in September 2001, and dedicated it the following month. Thus ended the 71-year home at Rt.108 and Meetinghouse Road, a building that served so faithfully and held so many memories. It was sold prior to opening the new facility. At the beginning of the twenty-first century, Sandy Spring was well-poised to face the new millenium. Because a substantial amount of the response district was non-hydranted, the need for on-site water supply was met in 2003 by the purchasing of a Kenworth T-800/Pierce 3,500-gallon water tanker. It also contains a 1250-gpm pump. It was placed in service as Tanker 4. Again, the department’s own money was used for adding advanced service for the community. The EMS fleet was updated with a county-assigned 2001 Freightliner/Wheeled Coach (Medic 49) and 2005 International/Wheeled Coach (Ambulance 408). To aid in the complexity of water rescue, Sandy Spring, using a grant from the state of Maryland, acquired a 2007 Alumitech air boat. It is 18 feet in length, with an 8-foot beam. It is powered by a V-8 gasoline engine, driving a 3-blade propeller. It can seat 3 personnel. After advanced training of a specialized crew, the vessel was placed in service in October 2009 as Air Boat 740. After 35 years of service, the canteen unit was in dire need of replacement. A 2007 Chevrolet C5500/2008 Krammes state-of-the-art vehicle was also placed in service in 2009, as Canteen 740. President Paul Lilly, in 2007, reviewed the performance of the rental hall. He brought the management and booking of the facility in-house, and mounted an aggressive marketing compaign, including changing the name of the hall to The Oakroom. This met with increased success in bookings and income. Many changes came to the overall fire-rescue service in Montgomery County. In 2003, the communications system was upgraded to an 800 MHz trunked radio system. Full computer-aided dispatch (CAD), vehicle mobile data computer (MDC), and electronic incident report filing were also added. A countywide fire-rescue chief, with full operational authority, centralized an integrated, standardized operational system in 2005. The Federal Emergency Management Agency (FEMA) developed a national incident management system (NIMS), which mandated training for all first responders. The majority of this comprehensive training is available online. The trend of training online expanded into the state and county training programs, reaching more personnel quicker, over a wider range, and with greater efficiency. The Washington DC-Metropolitan Council of Area Governments (COG) established a unified apparatus numbering system. Montgomery County was assigned the number seven. All unit radio designations begin with the unit type (for example, engine), followed by seven, and then the station number (i.e., E-704). Additional vehicles of each type are similarly numbered, with the addition of the military’s alphabetical sign (i.e., E-704Bravo). As the second decade of the new century dawns, change continues to occur at a rapid rate. Electronic patient care data filing has been initiated. Montgomery County offers centralized orientation training of new volunteer members, alleviating the need for each department to conduct this function individually. 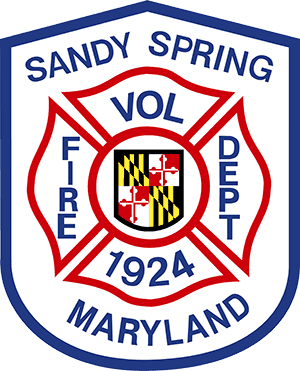 Sandy Spring has finalized plans to acquire an all-terrain vehicle (ATV), with firefighting and EMS skids. This will be used for response to limited-access areas, and for special community events. A refurbishment of Station 40 is also in the works. The county replacement of a new EMS unit and a replacement of the inflatable boat are pending. The department now responds to nearly 5,000 incidents annually with 3 pumpers, a 105-foot aerial apparatus, a heavy rescue squad, a tanker, a brush unit, a medic unit, 2 ambulances, an inflatable boat, an air boat, a canteen, 4 command and 2 utility vehicles. Researched and authored by Michael A. Valente, Secretary Emeritus, in May 2010. Some information provided in an earlier presentation by the late Past President David A. Brigham. Other sources included meeting minutes, other documents, and interviews.